The MCM being my first marathon will always be special. I could not however endup feeling a little cheated by the weather - the hottest day of the month had to be marathon day! Considering that a year back I could hardly run a single mile I am pretty satisfied to have finished a marathon. 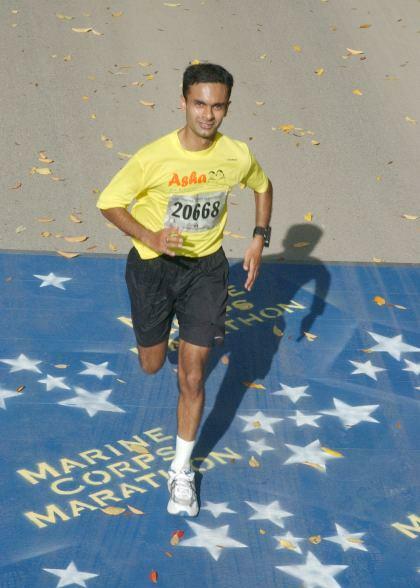 Overall, the organization of the marathon seemed great. Even though the lines for the packet pickup were long they moved really fast. Most of the complains from the previous years that I had read about (like Ultima etc.) had been taken care of. I think it will be very difficult for any race to match the hospitality of the Marines. When I finished I had atleast three Marines asking me multiple times if I was fine, getting me ice, powerade etc. With the weather forecast for a hot day I had kind of expected to suffer a bit towards the end. I had suffered towards the end of the 22 miler I had done in the 70s. Also, since most of my runs in the last few weeks were in the 40-50s I had probably become too used to comfort. I made sure I hydrated well. I either picked up Powerade or water at every stop in the course. In fact for the last two stops I picked up both Powerade and water (but this was probably because I had given myself a licence to walk through these two stops so I managed to convince myself I needed more fluid when I just wanted an excuse to walk). I also had 2 Cliff Shots during the race (but I had 3 for all four of my 22+ runs - could this have mattered?). The fact that there was a pretty consistent breeze and strong sun for most of the race caused a lot more sweat to evaporate (rather than run off). As a result at the end of the race I noticed that my shorts pockets were full of salt, and I was crusted in it! but I could not go on without that today (so I learnt what hitting the wall feels like). I restricted my walk breaks to 2-5 seconds since I was scared that if I walked for any longer I might never start running again. I did not see too many runners around me feeling strong so I guess the heat might have gotten to others too. This is where my Garmin Forerunner was really helpful. Even though it was off by 0.5 miles, it kept me motivated and kept me occupied (any thing I did during these moments would temporarily suppress the urge to walk). I have to give a special thanks to the anonymous runner who at around mile 26.1 gave me a gentle push and urged me to start running up the final climb to the finish when I had started walking … I guess I still have to discover how people come up with a final kick at the end of a marathon. At mile 25 I swore that unless I became crazy I would not run anything resembling a marathon anytime soon. I think I might be suffering from amnesia since after drinking 3 bottles of Powerade and lying under a tree for about an hour the thought of running another marathon kind of seemed exciting. I noticed the strength in my training not during the marathon but after it. The recovery from the soreness after the finish seems to be progressing pretty well and I got through without any injury. The weather on Marathon day was so good for anything except running that I ended up taking a 5 mile walk around the Capitol in the evening, after the race. - We started at 8:30 am rather than at noon so we had nice conditions for quite a bit. 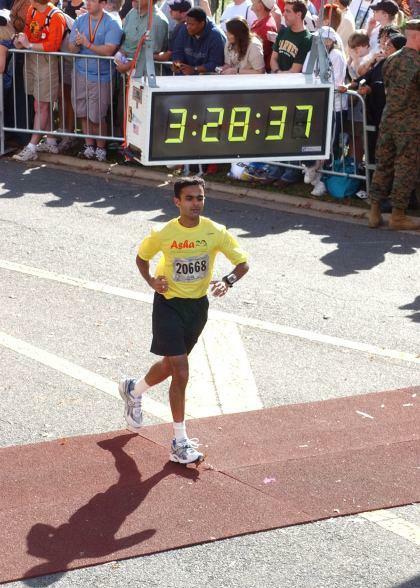 - Running Boston is a dream for so many runners. Many strive for years/multiple marathons to qualify for one. Having a DNF after all that effort is not easy to deal with. - The Boston course is surely more difficult to deal with especially in bad conditions.